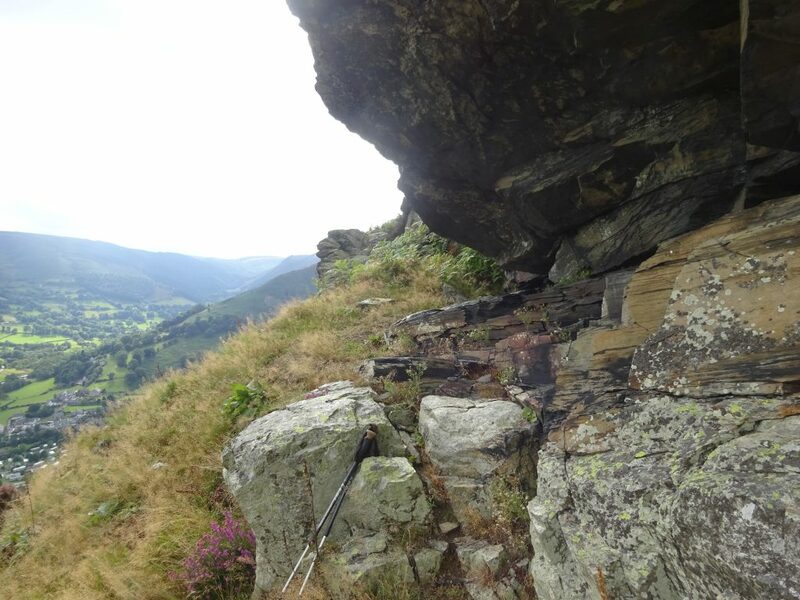 Igneous Intrusions, Volcanic Tuffs and Mineralisation near Llangynog. Photo 20 (above). 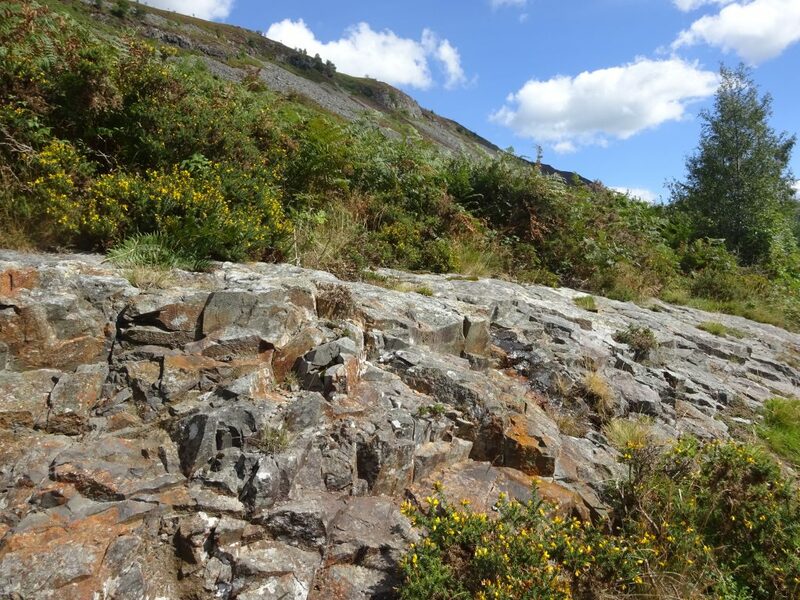 Near LLangynog village, in the southern Berwyn Mountains, a large feldspar-porphyry igneous intrusion penetrates the Llangynog Formation mudstones. Being relatively resistant to erosion, it now forms most of the steep rugged mountain of Craig Rhiwarth (532m). This intrusion may also be related to nearby lead, copper and zinc mineralisation (quarries in left background) and slate formation (spoil heaps in foreground). Photo 21 (above). 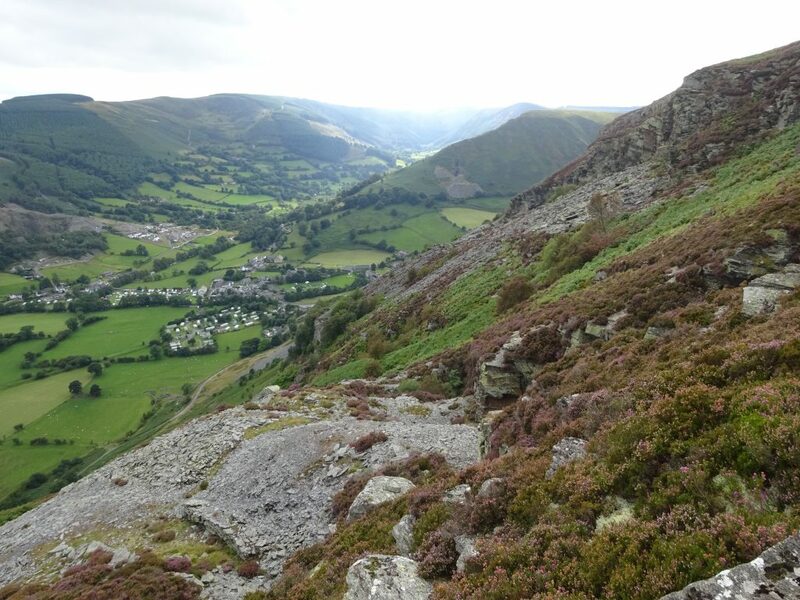 In the eastern slopes of Craig Rhiwarth mountain, spectacular layers of volcanic ash, probably the Godor Tuff (pale cream rocks in foreground) also occur within the dark grey laminated mudstones of the Llangynog Formation (darker rocks above). Photo 22 (left). The spectacular ash layers of the Godor Tuffs can clearly be seen in the south face of Craig Rhiwarth mountain. These tuffs clearly dip to the west here, as we are still on the western margin of the Berwyn Dome. However, the western cliffs of Craig Rhiwarth (Photo 23, below) are formed by the massive, crystalline, feldsparporphyry intrusion.